Please join me with many of the 100 Spartanburg artists who will spread out across eight local art galleries on the evening of Thursday, Nov. 17 as Spartanburg celebrates the publication of Artists Among Us: 100 Faces of Art in Spartanburg, the newest book from Hub City Press. From 6-8pm on the city’s regular Art Walk night, the artists will meet the public at the following galleries: The Showroom, Carolina Gallery, West Main Co-op, Spartanburg Art Museum, the Guild Gallery, Galley East, Art Lounge, and TJC Gallery. Books will be for sale at each site, and a free trolley, sponsored by the Community Healing Arts Program, will move between the galleries. This entry was posted in art gallery, artist, downtown Spartanburg, Home, Hub-Bub, Hub-Bub Showroom, Isabel forbes, landmarks, oil painting, Spartanburg SC, Uncategorized on November 16, 2011 by Isabel. The painting on my easel is currently a local landmark located just beyond Lake Bowen Spartanburg, SC I painted a small “thumbnail” version of this a few yars ago and now I’m tackling this 24″ x 36″. My overhead bank of natural lights create a faux skylight so I wear the visor to block out the glare. A painting this size so of “takes me in” and I feel like I’m right on the side of the road on Highway 11. This is beautiful country! In high school we’d cruise out 11 and feel like we were in another world. When I moved back to Spartanburg after being away for 30 years I was shocked to discover the Boiling Springs area (just down the street from this gas station) had turned into a megatropolis! Gone are the farms and acres and acres of peach fields. I was completely disoriented. 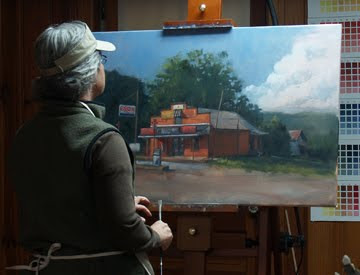 Part of my goal for 2011 is to get out and create plein air paintings to bring back to my studio to paint larger paintings of the many “roadside attractions” that are in danger of disappearing. This entry was posted in clouds, country landscape, downtown Spartanburg, exxon gas station, highway 11, Spartanburg SC, studio painting on December 15, 2010 by Isabel.